Delicious recipes that are delicious and also healthy for your hair! Autumn is here and nature is radiant in vibrant shades of red and orange! Vibrant colours not only adorn the trees, they also provide variety on our plates. Finally it’s pumpkin time again. This orange-coloured vegetable tastes delicious and is also very healthy. It even strengthens skin and hair! Your body needs a lot of help in the form of vitamins and minerals so that you can get through this dark time of the year feeling fit and full of energy. Pumpkins contain large amounts of beta-carotene, which the body converts into vitamin A. Vitamin A stimulates hair growth and makes your hair smooth, silky and strong. Autumnal red-orange carrots, sweet potatoes and peppers also contain beta-carotene, the wonder cure for hair. In combination with green vegetables, this provides ideal vitamin energy. The vitamin B in broccoli and spinach, for example, contributes to healthy hair growth, and the magnesium and potassium they contain also make the hair more resilient. Walnuts contain large amounts of zinc, which lends shine to the hair and guards against premature greying. With the following recipes you can give your hair and also your skin the nutrients and vitamins needed now to stay healthy during the autumn. Preheat the oven to 220°C (180°C fan). Remove the seeds from the pumpkin, cut it into slices and lay the slices on a baking tray. Drizzle with a little olive oil and sprinkle with salt and pepper. Roast the pumpkin slices in the oven for 40 minutes until golden brown. Leave them to cool slightly. Peel the garlic clove, chop it finely and mix it with the honey, olive oil and balsamic vinegar. Place the spinach into a large bowl and mix with the vinaigrette until the spinach is completely covered. Dry fry the walnuts briefly. 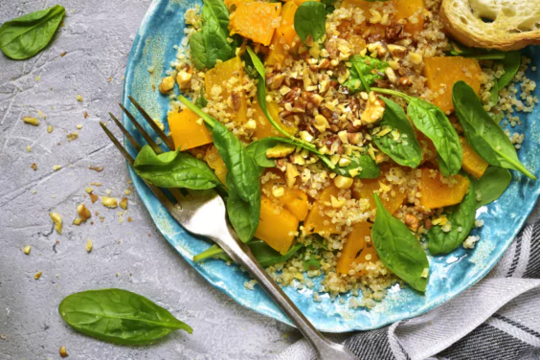 Arrange the pumpkin slices on a large plate, add the spinach and sprinkle the walnuts over the top. And enjoy! 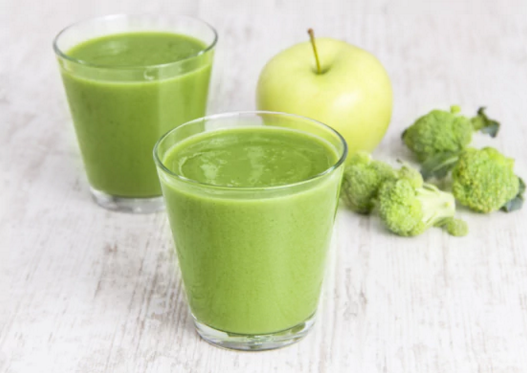 Wash the broccoli florets and place them in a blender together with the peeled and roughly chopped cucumber. Then add the banana, the apple cut into quarters, the mint and the ice to the blender and blend for around 2 minutes. Enjoy your healthy drink!